Gilles Aubry is a Swiss sound artist, musician and researcher living in Berlin. Based on an auditory approach of the real, his work is informed by researches on material, historical and cultural aspects of sound and listening. He uses field recordings, voices, music and sound archives to create live performances, installations and movies. 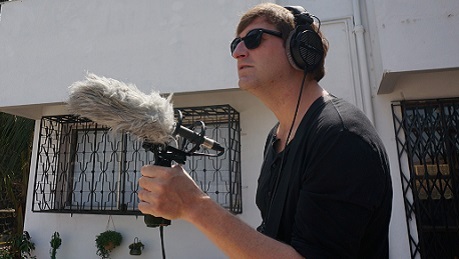 In 2013 he was an artist in residence at CONA in Mumbai for a research on material aspects of sound practices in the Bollywood film industry. His movie “Notes via Soundscape of Bollywood” was premiered at the Marseille International Documentary Film Festival (FID) in 2014. His installation “And who sees the mystery” was shown at the 2014 Art Biennale in Marrakech, based on a research with the performer Zouheir Atbane on the return to Morocco of the “Paul Bowles collection of traditional Moroccan music”. In collaboration with Rob Millis, his live performance „Jewel of the Ear“ mixed funeral recordings from Varanasi and early Indian shellac records, commissioned by the Art’s Birthday Festival 2015 in Berlin. With his installations “From A to Om” and “Tone Collection”, Aubry re-examined the epistemological framework of WWI-prisoners-of-war voice recordings from the Lautarchiv collection in Berlin, presented in exhibitions in Bengalore, Kochi, Karachi and Berlin in 2016. He recently won the European Sound Art Award 2016 competition with his installation “A Space of Attunement (from Oud to Guitar to Oud)”, awarded by the German WDR3 Radio station. He has toured and exhibited internationally, including Kunstraum Bethanien Berlin (2016), Clark House Mumbai (2016), Art Council Karachi (2016), Skulpturenmuseum Marl (2016), FMAC Geneva (2016), MAGA Museum Gallarate (2015), Kunstmuseum Lucerne (2015), Khoj Art Center New Delhi (2015), TUSK Festival Newcastle (2015), Tsonami Festival Valparaiso 2014, Savvy Contemporary Berlin (2014), Friedmann Gallery New York (2014), Marrakech Biennale (2014), LEAP art space Berlin (2013), HeK Basel (2013), House of World Cultures Berlin (2012), Kontraste Festival Krems (2011), MACBA Barcelona (2010). Aubry is also a musician in experimental noise band MONNO and his solo works are available on the labels Adocs, Winds Measure, Cronica Electronica, Gruenrekorder, Universinternational and Absinth Records. His latest LP “And Who Sees The Mystery”​ is available on Corvo Records.